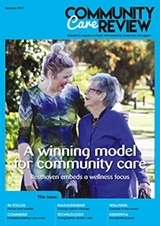 Community Care Review is a new magazine focusing on the community care sector, produced by the team behind Australian Ageing Agenda. The community aged care sector in Australia is undergoing significant change, with landmark reforms to both home care and home support. These reforms include the implementation of the Commonwealth Home Support Program, the full rollout of consumer directed care in home care, new arrangements around quality review, and potentially massive changes for respite provision. The remit of Community Care Review broadly includes home care, home support, respite, reablement and home modification. It also examines the links between ageing and disability, not to mention other domains such as mental health. Community Care Review is underpinned by informed analysis and comment, as well as evidence-based advice. Regular editorial sections include Management, Frontline Issues, Clinical Report, Education & Training, Resources, Legal, Finance. Community Care Review provides a new space to examine the important issues impacting community care, to facilitate discussion, highlight innovation, and share knowledge.